A perfect Jasprit Bumrah over was not enough for India to win the first T20I as Umesh Yadav conceded 14 runs in the last over to give the Aussies a 1-0 lead. While bowlers did a good enough holding job, middle-order’s failure was the biggest reason why India put up a dispirited display. Rohit Sharma (3/10): It was an off-day for the India vice-captain. From the very first over, he failed to have a proper connection with the ball and only from that, you knew that he was not going to do anything today. He mistimed a shot to be dismissed in the third over, a reminiscent of the way he started the IPL 2017. Needs to pull up his socks before the Bengaluru game. 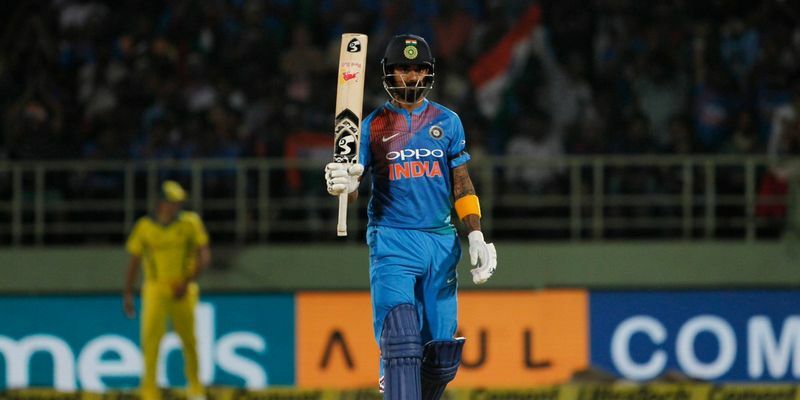 Lokesh Rahul (8/10): It was an innings that has literally everything that one would expect from KL Rahul. His failed judgement against the in-duckers, some brilliant drives on the up, and coupled with the struggle against the short balls, but his 50 was the basis on which India stood at a decent position after the first innings. Rahul would take that anyway, especially because of all what had happened to him in the last few months. Virat Kohli (7/10): In Internationals in Vizag, Virat Kohli's scores before this game read - 118, 117, 99, 65, 167, 81 & 158* and Vizag is not new to Kohli epics anymore. Probably the law of averages decided to catch up with him and he was dismissed for 26. However, his short innings had a lot of promise to offer and his partnership saved India from blushes. The thing that goes against him is that he was set and could have gone on longer. Rishabh Pant (4/10): Of course, he was at the receiving end of a great run-out, but he should have been more careful. Playing away from his body directly to the man at point, and going for a run, was nothing less than audacious. India promoted him in the order to give a better account of himself, but Pant has not been able to grab that up cleanly. MS Dhoni (5/10): What a bizarre innings it was! MS Dhoni came out to bat in the 11th over and had the entire 10 overs to launch the assault, but all went awry for him as India lost wickets at the other end regularly. The death bowling was good, but how could you explain his inability to clean the boundary today. Could surely have done way better, but his guidance to the spinners and clean anticipation as a keeper means I am giving a couple more than what I initially thought. Dinesh Karthik (3/10): What was DK thinking? At a time, when he had already conceded his ODI spot to Pant, and the chief selector has already mentioned that it is a battle that will be decided on the limited chances the players will get, Karthik messed it up big-time. Even before the ball was pitched, he moved down the ground and played a nothing shot to be dismissed for one. A missed chance that may never come back. Krunal Pandya (7/10): Scored one run off six balls when all the team required him to be more patient and score some runs. The wicket was surely not difficult to bat on and playing against pacers was pretty easy as Rahul demonstrated. However, he redeemed himself a bit with the ball in the hand, and taking the benefit of slow pitch, he pulled India back in the game. His economical bowling was one of the major reasons India were back in the game in the last five overs, which almost made it up for his batting. Umesh Yadav (1/10): Can I give him Zero, if you wouldn’t mind? If this doesn’t end his limited-overs career, even though in the team of “replacements for replacements”, then the national selectors will have a lot to answer. The Vidarbha pacer was nowhere close to average, and when the game was perfectly set-up by Bumrah, he bowled the off-stump line despite having an army of fielders in the leg-side. Going with one for him. Mayank Markande (6/10): The debutant was surely nervous with the stage and it was clearly shown in his body language. With a couple of tough chances being dropped, Markande had further lost the confidence, but he didn’t show that at all. Not a terrible outing as he would try to better himself and do well in the next game. Yuzvendra Chahal (7.5/10): MS Dhoni might not have trusted him with the bat, but Chahal is still India’s one of the most prolific spinners across conditions. He showed that today and managed to restrict the run-flow in the middle-overs, and one over in the powerplay, which eventually made the game more interesting and gave India a chance to win. Sure it could have been better, but not that bad if you look at it as his effort as a bowler. Jasprit Bumrah (9/10): #BumrahForPresident! Make it trend on all social media. Give him all accolades and tell the world that he is the best in the world without a shadow of a doubt. Jasprit Bumrah did all things right and conceded just 16 runs in four overs to send three Aussies back to the hut. It was a performance one would dream to have in a game of cricket and Bumrah was a lucky owner of the badge. A perfect T20 bowling performance, if ever there is one.